Before we examine the study, let’s first consider the excerpt. Line 7 of the study is not identical to the excerpt, but you can clearly see Weissenborn’s imitation of that portion of the bassoon solo although not all of the notes sound the same. Lines 9 and 10 provide an opportunity to practice phrase shaping during articulated notes and rests. Mastering the exercises I give to you below will really help you to gain control over your articulation. First let’s practice the section with different articulations. Also use a metronome. I use the tempo 84 for the eighth note. I suggest practicing it slurred several times so you can really sense the phrasing you are making with your air. When you achieve a phrasing you like, you will need to keep this regardless of what the tongue does. The 32nd note is very relatively fast so I don’t think I can distinguish five different articulations on that note. I should be able to make three different articulations, however: legato tonguing (5), medium (3), and staccatissimo (1). Just for our practice here I will keep the 16th note with legato tonguing and vary just the 32nd note. First I will do it on a single tone and then as written. Voice over. Let’s take a visual look at the sound waves I produced. I created a short audio clip from the video and then I have lined up the graphics of the sound waves in a software called “Reaper.” The top channel is length 5, the next channel is length 3, and the last channel is length 1. Visual observation shows some inconsistencies with the length of the 32nds and especially the timing of the notes. Boxes number 1, 4, and 5 are pretty good. The notes show the correct lengths and generally start at the right time. Boxes 2 and 3, however, show timing problems especially with note length 5. I am also not quite as pleased with the note lengths. Remember that the starts to each note should occur with the same timing. It is only the duration of the 32nd note that is varied here. Now let’s practice by varying the length of the 16th note from 5 to 1, with all of the articulations. I will keep the 32nd note at number 5. It is a real challenge to keep the phrase shape the same and change the articulations. 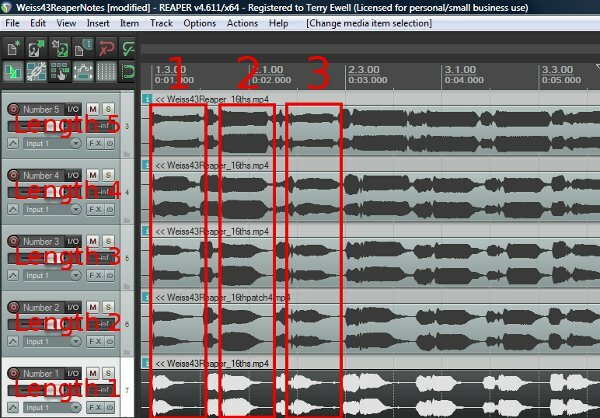 Again we are looking at a representation of the sound waves in the Digital Audio Workstation called Reaper. The channels are arranged from length 5 at the top to length 1 at the bottom. You can see that I have excellent control over the note lengths. With few exceptions there are clear differences between the lengths of the 16th notes in boxes 1-3 and the following sound waves. However, there are inconsistencies with my timing of the notes. This is something I need to work on more! When you have mastered those articulations, “mix and match” the notes. For instance, try playing “5” on the 16th notes and “1” on the 32nds. Or “2” on the 16th notes and “5” on the 32nds. Gaining this command of your articulation will open up a whole new world of musical expression for you! “Almighty God, you look down into my innermost soul, you see into my heart and you know that it is filled with love for humanity and a desire to do good.” QUOTATION Maynard Solomon, Beethoven Essays, (London: Harvard University Press, 1988), p. 218. We don’t know the suicide rate for those living in the 1800s in Europe, but Beethoven was certainly a candidate for an early death. His own writings detail his despair with life due to his loss of hearing. The document named Heiligenstadt Testament indicates the severity of his despair and his thoughts about giving up on living. The quote I read at the beginning of this reflection is taken from the Heiligenstadt Testament. This is Beethoven’s prayer to God. Beethoven’s faith in God played an important role in helping him through this difficult time. Despite his torment and problems, Beethoven had much beautiful music yet to give to the world. Perhaps you are going through difficulties now. My prayer for you is that God will help you through those problems so that you can provide others with many blessings from your talents. I regret that I am not able to supply you with a performance of this study. Upon listening to my recording I realize that I slipped into a very common error: performing with a triplet rhythm rather than the divisions of four required. I will perform for you here portions of the study, but regrettably the recording will not be to same standards as those performed in the Towson University Recital Hall. Beethoven quotation: Maynard Solomon, Beethoven Essays, (London: Harvard University Press, 1988), p. 218.